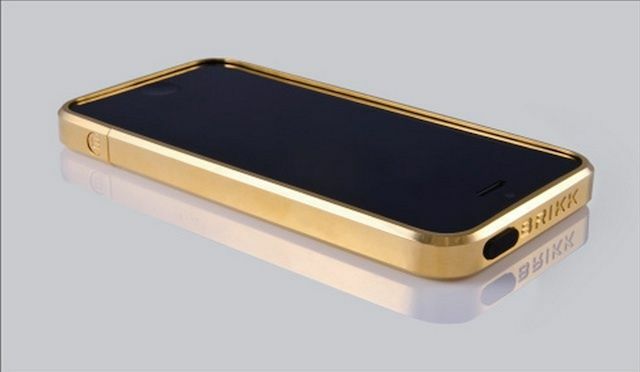 Over the last few years, we’ve seen a ton of really stupid and really expensive iPhone cases. The worst part about the expensive ones is that they’re not that great at protecting your iPhone, and this latest case for the 1% is no different. Meet the Haven case by Brikk. It’s not even a case really. It’s more like the bumpers Apple made for the iPhone 4. Except the Haven is made out of solid gold or platinum and will only cost you $11,610 for the cheapest model. The case wraps around the sides of your iPhone 5, leaving the front and back completely exposed. But if you’ve got enough money to blow on one of these cases, you’re probably not worried about shelling out an extra $600 to replace your iPhone from time to time. Each case is made from 75g of gold, retails for $11,610 and you can chose from Pink Gold, Yellow Gold, or Yellow Gold Satin. If you want to spend a few thousand dollars more, you can elect for the 100g Platinum model that runs $14,235. The company can also make you a case with diamonds and a custom finish, but you’ll have to call to find out the price tag.